I know exactly how to find the perfect gift, and all it takes is a little bit of diligence. So you want to find the perfect gift, but you don’t even know where to start. You’re looking for your loved one, or friend, or maybe frenemy, and you need to give them something that’s worth their while, and it feels impossible. You think you’re going to end up searching last minute for something that at least won’t be bad. Well luckily,I know exactly how to find the perfect gift, and all it takes is a little bit of diligence. Whenever I end up getting a bad gift for somebody, it’s because it was last minute. Maybe because I was busy or maybe I forgot until the day before, but the gift will never be great if you don’t put thought into it. The first thing anyone should do before buying the perfect gift is to make sure you know when you need the gift buy and plan accordingly. If you know the person you’re buying the gift for is very particular and you’ll most likely have to order something or have to spend a while searching, you need to know when you’ll need the present by and I would suggest to start thinking about the gift at least a month in advance. Now, a month in advance might sound way too early, but here’s why I wouldn’t wait a second later: if you give yourself an entire month to be thinking about the present, odds are the present will come to you. Perhaps you’ll hear your recipient mentioning some things they wish they could have or see a commercial which is exactly what you were looking for. More often than not, if you’re around this person enough, or maybe just shop online a lot, great gifts show up all over the place. Point is, if you give yourself time to work with, instead of finding yourself in a desperate pinch for something that’s only good enough, you’ll be able to wait for the perfect gift to come to you. 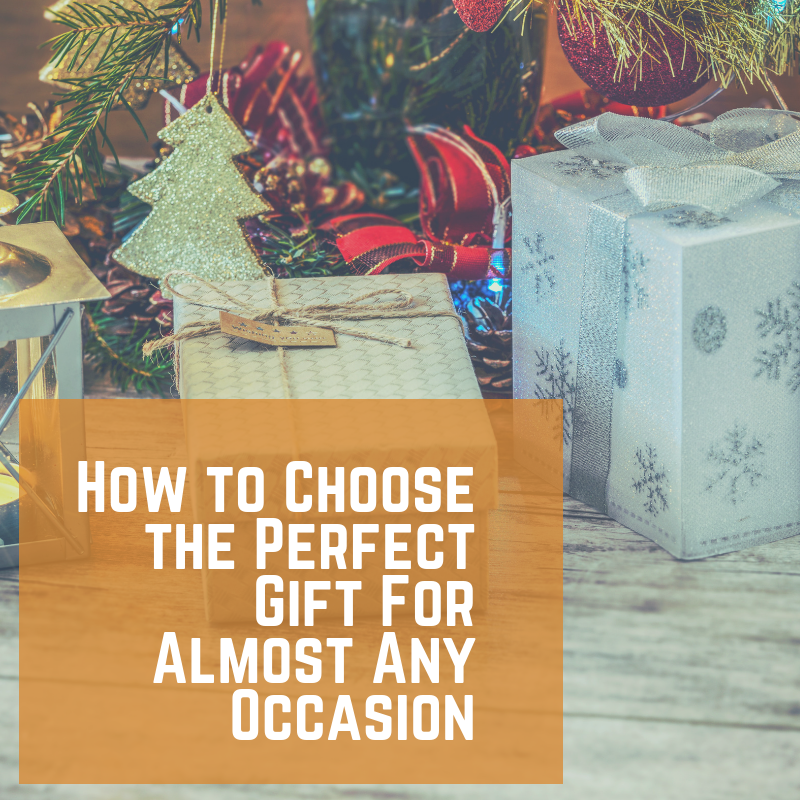 As mentioned earlier, it’s likely that the person you’re buying the gift for will give you a hint as to what they want to buy, however, this isn’t always easy. If you’re fortunate, the person you’re buying for is outspoken about their preferences without coercion, and will let you know exactly what to get for them, but most likely that will not be the case. However, listening carefully can sometimes give you the perfect gift idea. Maybe the person has something which constantly bothers them, such as not getting enough sleep because it’s loud where they live. A super easy present for them would be some high-quality ear plugs. Sometimes listening to what people don’t have versus what they want can become the gift you were looking for. So maybe that didn’t work out so hot. There’s absolutely nothing which your recipient has mentioned or told you about which they like or want and you haven’t seen anything which suits them on TV or the internet. Here’s the good news: you still have a ton of time! You started looking a whole month in advance and even though it’s been a week or so, you still have a good amount of time to even order something if you have to (especially if you’re an amazon prime member), but you still have to find that perfect thing. My suggestion is to start looking for inspiration. You can find some really good gift ideas at giftlightbulbs.com or dodoburd.com. And there are so many different things on the internet that something has to be the thing you’re looking for, but the internet is enormous. There’s about a million different retailers and shops with who knows what available, or even take a walk around your local supermarket and even if they don’t have what you’re looking for, odds are that you can find a higher quality version online. You’ve looked through every website you could and you’re still not sure what to get. Frustration is setting in. You’re starting to get worried if you’ll ever find that perfect gift. Do not despair, there is an ultimate fall back for anybody, for any occasion, to help you find the perfect gift: custom items. Though this may not always be the cheapest option, it will without a doubt make for the perfect gift. Nowadays, there are a world of artisans online willing to make custom anything and everything; from jewelry to underwear, there is someone with the skills to make the custom item just right for your recipient. Whether that means names embroidered on a bracelet, or a map of the night sky from an important moment in your relationship, artisans around the world are ready to fulfill your need. This is the perfect gift for anyone for any occasion; no one will be able to deny the effort and thoughtfulness you took in picking out this gift and you’ll amaze everyone with a gift that you can’t find anywhere else.